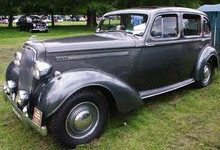 Following the end of WW2 the Humber motor company launched hastily prepared versions of its 1939 model range. 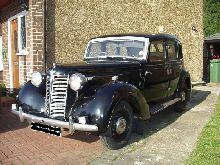 The smaller model of the new range was named Hawk and used the pre-war Hillman 14 as its base for the main mechanical components. Powering the Hawk was a sidevalve four cylinder engine of 1944cc and its performance could perhaps be described as "leisurely"! Despite its lack of power the Hawk looked very dignified and featured a substantial four door, six light body complete with "Sunshine" roof. Improvements on the original design included a hydraulic braking brake system and plusher trim. In 1947 the Hawk was updated and became the Hawk II. Although basically the same as the 1945-47 model the new Hawk now inluded a fashionable column mounted gearchange. Production of the Hawk II finished in 1948 with the arrival of the modern Hawk III. 9' 6" 4' 8" 15' 0" 5' 9" 0 (26) 0' 0"